China, the gateway to East Asia, is a fascinating country. It is an ancient civilization that gave the world Peking Man, gunpowder and noodles. Visitors making their first trip to China usually stick to the larger cities. More experienced visitors to the Middle Kingdom will strike out in other directions, where traveling may be a bit more frustrating because of the language barrier, but most definitely doable for independent travelers. An overview of the best places to visit in China. China’s vast and diverse territory endows the country with some of the most beautiful natural scenery on earth. From the picturesque karst landscape in Guilin and Yanshuo to the precipitous pillars in Zhangjiajie, from the colorful lakes in Jiuzhaigou to the Rainbow Mountains in Zhangye, China’s diverse natural beauty is as impressive as its splendid culture. Beijing is the current capital city and remains one of the most popular places to visit in China. Its history dates back more than 3,000 years and much of that history is still alive within its borders. Beijing literally means Northern Capital, a role it has played many times in China’s long history. The city is home to Tiananmen Square, the Forbidden City, the National Museum of China, as well as the Old and New Summer Palaces. 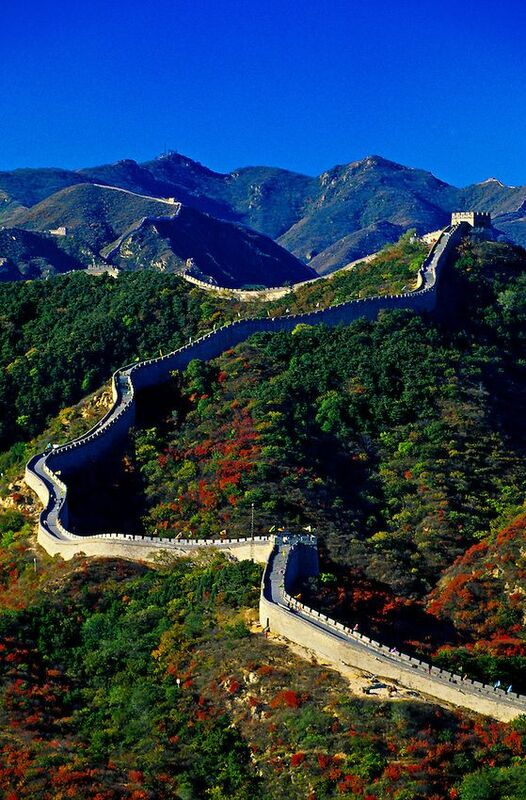 The Great Wall of China is an assemblage of smaller walls built by various dynasties over many years. Builders erected these walls for protection from invasions by those from the north. The Great Wall itself, with a history lasting over 2000 years, measures approximately 8,800 km (5,500 miles) in length, although some of the sections lie in ruin or have disappeared altogether. It is the longest man-made structure in the world. Famed for its natural scenery, Hangzhou and its West Lake have been immortalized by countless poets and artists. In the 13th century Marco Polo described the city as the most beautiful and magnificent in the world. Hangzhou’s most famous sight, West Lake, is a large lake separated by causeways and lined with ancient buildings and gardens designed for relaxation and spirituality. Visitors will find pagodas, temples, walking paths and tea farms along its shores. Located off China’s southeastern coast, Hong Kong is a glittering, world-class commercial center where Chinese culture, British colonial influences and modern day high-technology blend together. While it contains the world’s highest concentration of skyscrapers and one of the highest population densities, Hong Kong also offers plenty of green spaces, mountain views and beaches. Jiuzhaigou Valley has been described as a fairyland because of its many waterfalls; snow-covered karst mountains, and its 108 blue, turquoise and green colored lakes that are so crystal clear one can see the bottoms. It is also the habitat of giant pandas, though the chances of seeing them are slim due to the park’s size and the number of tourists. Kunming is the economic, transportation, industrial and cultural center of southwest China. It is linked by rail from all of China’s major cities as well as with Vietnam. The mild climate makes it a good place to visit any time of the year. In addition to its own charms, Kunming serves as a base from which to explore the rainbow of ethnic minority in the area. Lhasa is one of the most important cities in Tibet and one of the highest elevated in the world at 3,500 meters (11,500 feet). Lhasa, in spite of its absorption into greater China, has retained much of its culture. It is home to the Potala Palace, which was the former home of the Dalai Lama. Located on the East China Sea and the mouth of the Yangtze River, Shanghai is the largest city and most developed city in China. Its skyline is filling with skyscrapers while shiny shopping malls, luxurious hotels and prestigious arts centers are rising alongside. The city nights in Shanghai are representative of the Western view of China cities with bright neon signs, bustling streets and numerous businesses. Xi’an was once the start of the indispensable Silk Road that made commerce between many countries in Eurasia possible. It was also one of the Four Great Ancient Capitals of China. Its most famous attractions is the rather recently discovered Terracotta Army, the protectors of the tomb of the first emperor of China. Yangshuo was once a magnet for backpackers because of its cheap prices and laid-back atmosphere, but today it draws all sorts of travelers to enjoy its beautiful scenery and karst mountains. Yangshuo also makes a good base to take a day trip to Guilin for a leisurely trip on the Li River.